It's pretty much a guarantee that the score to an animated movie is going to be full of diverse and attention grabbing themes. 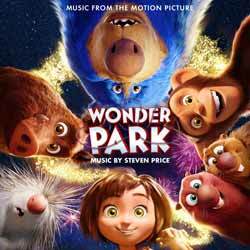 Steven Price's (American Assassin; Fury; Gravity; Suicide Squad) work on Wonder Park is no exception. The album contains 22 tracks (1 hr, 09 min, 46 sec) with too many highlights to chose from. However, 'To Clockwork Springs' is an all round engaging track and 'Peanuts Next Wondrous Invention' reminded me (at the 0.49 sec mark) of Rob Simonsen's score for The Age of Adaline. Talking about the project, Price said: "Wonder Park is really a story about imagination. June and her mom spend countless hours imagining, designing and building models of an amazing park, complete with rides such as Fireworks Falls and the Skyflingers, all powered by the magical Clockwork Swings, the heart of the park. The park is their game, their shared project taking over their whole house and sometimes the whole neighbourhood, and, as the film progresses, we see June entering this world for real. Musically, the film couldn’t have been a more exciting thing to write for. I needed to capture the sense of this park, and June herself, full of fun and imagination, and also how the state of the park reflected June’s emotions. It seemed an opportunity to deliver something really thematic. The principle two themes of the film are the Park theme, where I really wanted to capture something classic, melodic and celebratory, a kind of fanfare for the imagination if you like, and the Mom theme, a more introspective theme that helps us connect with June’s emotions as the story develops. Also needed were motifs for some of the principal characters in the park itself, the team of animals led by Peanut the Monkey that all work together to save the park from the darkness that envelopes it. Underpinning all this, and central to the film and its score, is the idea and the sound of the Clockwork Swings." Overall this is a rollercoaster ride (I can't believe I've shoehorned that bad joke in) of thrills and melancholic themes. A truly magical score.